When I was a little kid at Burt School in Burt Michigan I always knew who the rich kids were by the quality of toys they'd bring to school. Whether it was Popeye battling a Japanese tank(made in Japan no less) or a pair of really cool mounted knights in armor which jousted by pulling a little string to activate a spring-driven motor, they had the most breath-taking toys. Poorer kids (like me) had Auburn rubber toys. I saw a lot of those Auburn firetrucks and motorcycle cops. On one particularly memorable Christmas (I may have been five years old) my parents got me an Auburn military train. Now make no mistake, this wasn't an electric train set - it had no tracks, but it was a rubber (meaning flexible plastic) black locomotive and red caboose with two gray flatbed cars in the middle. On the flatbeds were those wonderful Auburn military vehicles - tank, truck, half-track (my favorite), and jeep towing a howitzer. It was very cool though I used the vehicles way more than I did the train; and I used those cool vehicles in endless bedroom floor battles. The Marxmen I became most familiar with were the cool Civil War guys from the Blue and Gray playset. Although my big brother Joe had a second-hand Fort Apache I didn't connect it to Marx as I was not yet all that familiar with the brand. I was only vaguely aware of other sets including Rin Tin Tin, the Army Training Camp, and the fodder for this post - the 7th Cavalry. Here's a group of Paragon (dark blue) and Toy Soldiers of San Diego (TSSD) cavalry figures. Here's a similar grouping of Marx 7th Cavalry troopers. Let's do a little side-by-side, shall we? The Marx wounded guy (with original playground dirt) is less demonstrative than his Paragon comrade though perhaps more convincing. I love the revolver dropping to the ground. Sword guy from Marx is pretty minimalist with oddly calm expression and nice suspenders. The paragon guy is richly detailed and Sam Neil-esque in expression. Call it sentimentality, but the Marx guy has more appeal to me. Running guys. The Marx mennonite (judging by his hat) on the left and the TSSD guy on the right; both running to, or from, who knows what? Again, for level of detail there is no comparison, TSSD wins hands-down. But for the magic of childhood memories give me the guy on the left (with the playground patina archivally intact). armed man in a hurry! The sculpting of the Marx figures is the definition of elegance - simple beauty. I love detail as much as (actually more than) the next guy, but there is something about the clean lines of Marx figures that has always appealed to me. Direct your attention to the detail. Check out the locks on the carbines. TSSD has the detail but they both seem equally lethal in intent. Pardon the blurriness but look at the difference in holsters - Paragon on the left and Marx on the right. By comparison the Marx effort is more the "suggestion" of a holster. It worked for this kid. Look at the difference in bases. TSSD provides sculpted terrain, Marx takes a guitar pick approach. The former gold standard of army men. The stuff childhood dreams are made of. 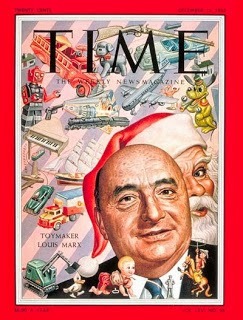 Louis Marx was a master of marketing and a genius for capturing the imagination of a generation of kids. I always find myself thinking warm thought of him in the holiday season, I hope you do too. they merely had better hand-me-downs than the rest of us. Since posting this entry I came across several more of these Marx cavalrymen. I can now account for all but three of the full set. Missing are the walking guy, the standing shooting guy, and the clubbed-musket guy. and this very vigilant trooper. I like this relaxed cavalryman with neither sword overhead or pistol in hand. Seldom do we see a merely relaxed soldier pose such as this. Splendid sculpting and a very nice post-war kepi. I'm happy to have reunited this group. Now only if the last three would show up. 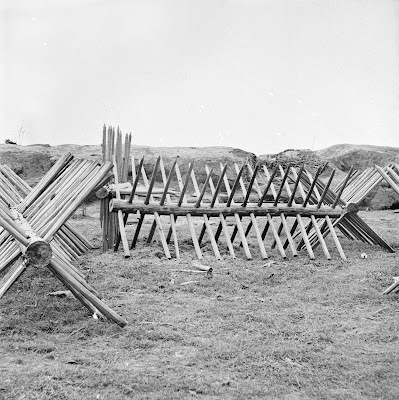 You regular readers of this blog know that I am very partial to toy artillery. Seems I've lavished a lot of attention on the subject. Well now here's a little video demonstrating the battlefield prowess of the "long arm", fighting it out on my tabletop battlefield. Follow this link for Toy Soldiers Forever! 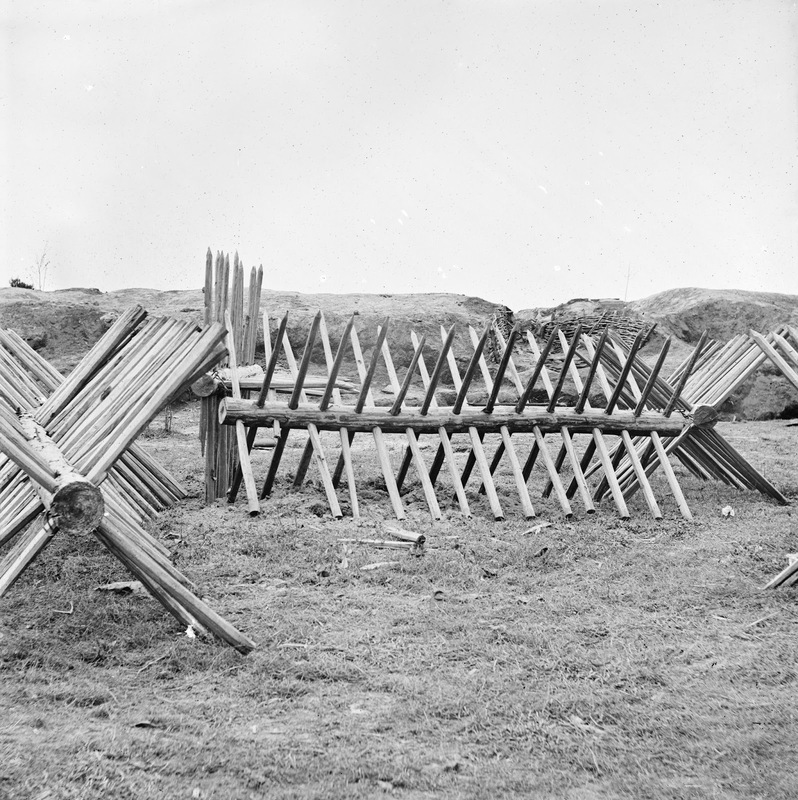 artillery action. 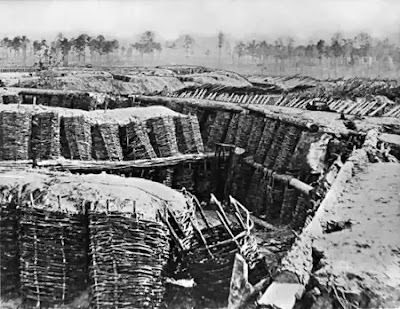 From june of 1864 until March of 1865 besieged Confederates lived in a thirty-mile system of trenches outside of Petersburg, twenty five miles below Richmond Virginia. With the fall of Petersburg the war in the east ended only weeks later when Lee surrendered to Grant. A rebel taunts the foe beyond no man's land. Rebels in the forward rifle pits..."do you hear tunneling?"